A huge 800 Piece wheely tub to keep building and building. 676 Clics + 124 accessories and a set of 15 building cards. Extra building plans also. Use the removable wheels from the tub in your constructions! 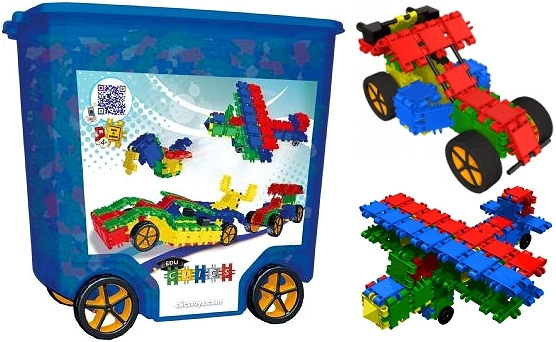 Clics are coloured plastic building blocks that clic together to form hundreds of different models, limited only by the imagination of the user. Produced in Bite-Proof Safe polypropylene they are durable and able to withstand prolonged use under all conditions. Includes accessories such as wheels and axles for extended play. Free set of laminated building plans in the tub.